1) You are saying that education is very important to you and your child. It is so important that you would rather pay for quality than receive less than that for free. 2) You are saying that you want a school that will educate your child as a person not just her intellect. You are choosing an environment that emphasizes Christian values; an atmosphere that fosters responsibility and requires courtesy. Catholic schools were once considered only for Catholic students. 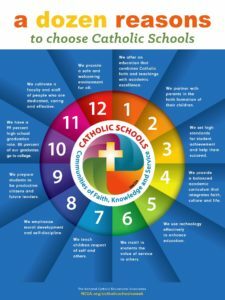 Now, however, Catholic schools welcome all students who want an academically challenging education in an environment of empathy, trust, and loyalty. According to the National Assessment of Educational Progress test, students in a Catholic school do better academically than their peers in public schools, are less likely to drop out, and are more likely to go to college. In choosing a Catholic school you can be assured that your child will receive a strong academic education in an environment structured to provide lasting value. Families in a Catholic school are there because they choose to be there—and that makes all the difference. Bound by common goals and aspirations, students find an atmosphere where academic achievement is valued, and doesn’t conflict with social acceptance. While intellectual curiosity can’t be “taught,” it can be “caught.” Your child’s individual interests can be encouraged and rewarded, laying the foundation for a lifetime of achievement. Self-discipline, responsibility and self-motivation are among the benefits of an environment that is both nurturing and structured. A Catholic school is able to provide a disciplined environment because it has control over who is admitted, who stays, and how students are expected to behave. Teaching the “whole” child is a priority, and lessons in empathy, respect, and responsibility will be part of your child’s daily life. Catholic schools attract teachers who look upon education as both a vocation and an avocation. The majority of teachers are Catholic and highly committed to developing both the spirit and the intellect. They are chosen for their abilities to serve as role models, as well as for their teaching skills. Teachers are selected for their knowledge of a subject and their ability to teach it, rather than for the kind of degree they possess. Performance is the key. Your Catholic school is directly accountable to the families it serves. Parents select the school—and keep their children there—on the basis of results: the solid academic preparation and personal growth they see occurring in their children. Performance—that’s what builds and maintains your Catholic school’s reputation in the community. Part of accountability is being responsive to the changing needs of students and to the changing requirements of the “real” world. Your Catholic school responds to your needs as a parent by supplying services to make your life a little less complicated. 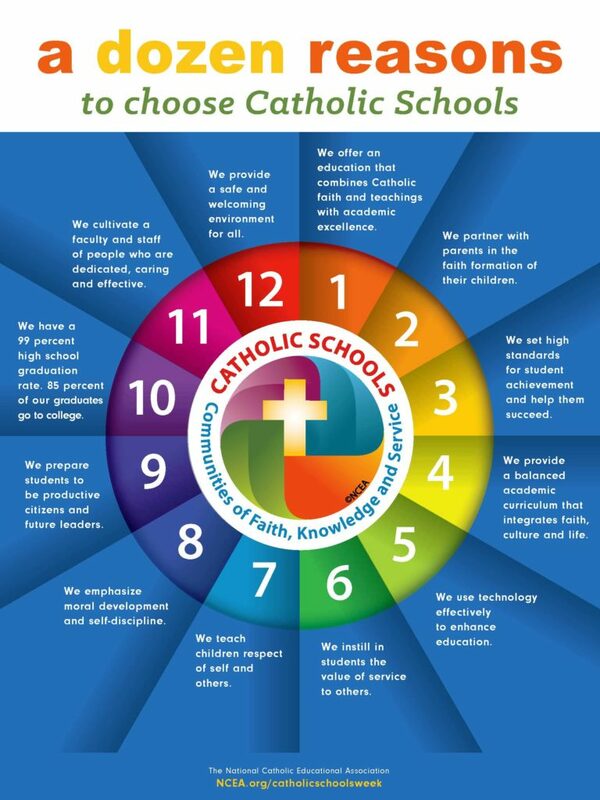 When you choose your Catholic school, look for the services that are appropriate for your family and your circumstances. Your Catholic school welcomes—and expects—parent involvement. You will be asked to oversee your child’s study time and to regularly review their homework. You participate in the social life of the school and help the school advance. You’ll find that when you enroll your child in a Catholic school, you join the school family too and are a part of your child’s life and development.